“Being escorted up here tonight reminds me of back in 1927 when I was escorted from the University of Wisconsin where I was enrolled, by none other than Cliff Goerke, Les Smith, Kook Smith, Bud Sivage and Jake Supeda – to Carroll. When I enrolled at Carroll, I don’t know how many of you will remember, Bible was a required freshman subject, but those same Sparta buddies told me that if I enrolled as a Catholic, I wouldn’t have to take Bible. It was not long after that I became interested in a Presbyterian minister’s daughter, and soon has a seat in Zach Davie’s Bible class’ I have always been grateful to my friends for escorting me to Carroll. I managed to pass my Bible class – married the minister’s daughter – later returned to Carroll to coach and teach, and have been a business man in this community ever since. 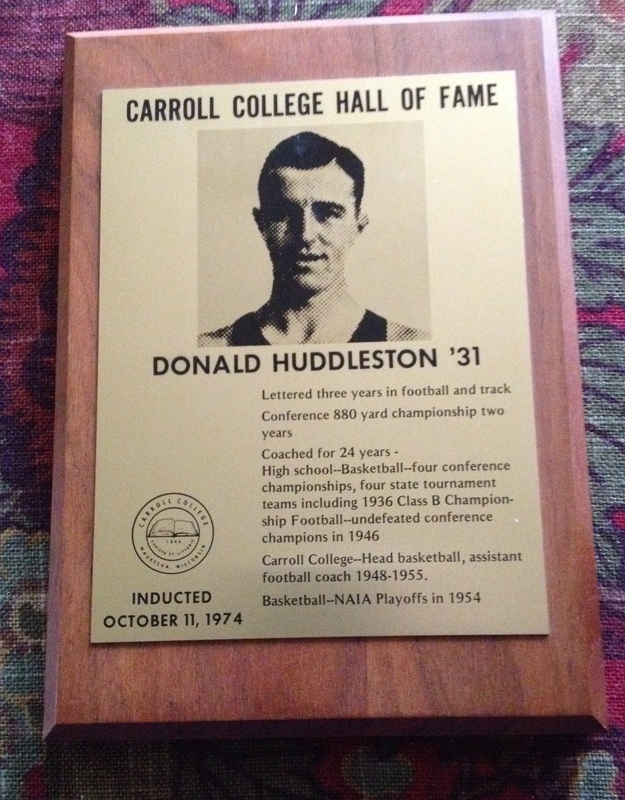 I am very proud to have been chosen to be a member of Carroll’s Hall of Fame, and appreciative of this honor.” My sisters and I are also grateful that Dad’s friends abducted him from Madison on that fateful day!